Sunday, May 12, departing at 8:30am (8:00am from the subway). Cost: 430 RMB (385 RMB for members); Difficulty Level 3+. In Brief: Walk both restored and unrestored sections of Great Wall on the way from the Huanghuacheng Reservoir all the way over to the Xishuiyu Reservoir. Some sections steep! Hikers on the way up the Great Wall at Huanghuacheng. Just so you know: There’s a lot of crossover with our other hikes in this area, and if you’ve done any of those then you will have probably done most of this hike already. The trail is slippery in a few places, and we make a detour around a tricky section. We’ll take it slow as you like heading up, and we’ll take another break at the highest tower – an excellent place to take a few photos of the surrounding mountains. We’ll follow the wall towards the Little West Lake, and on a clear day the views here are amazing, with a line of wall plunging down towards the Xishuiyu reservoir. Before the wall gets too steep we’ll branch off on to a hill trail that leads us down to the bottom of the hill, where our hike will finish. While we’re on the wall, the climbing is steep. We hiked all of the Great Wall at Huanghuacheng, starting off at the Huanghuacheng Reservoir and finishing at the Little West Lake—see a set of 17 photos. 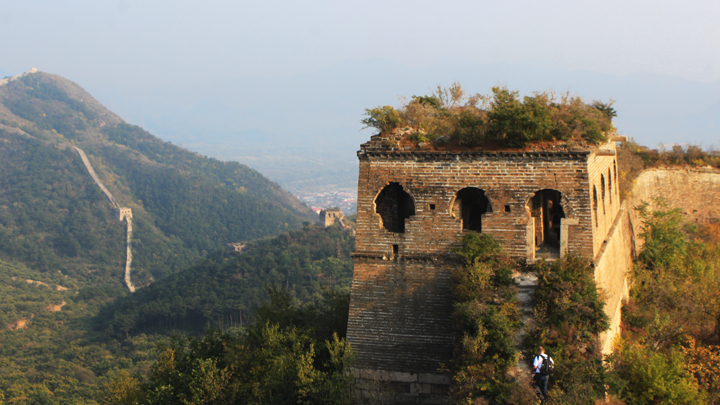 See 30 photos from a fun hike on the Great Wall from Huanghuacheng to the Little West Lake. 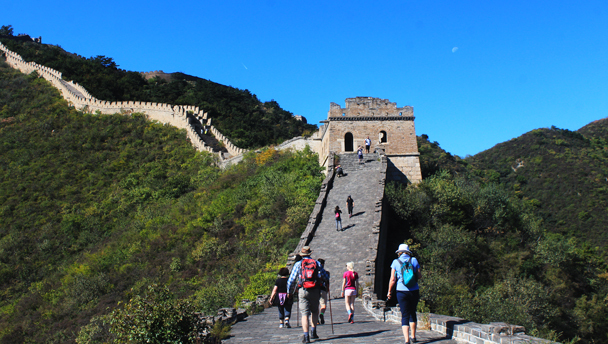 A set of 18 photos from a hike along the Huanghuacheng Great Wall—hot weather but awesome views. Thirteen photos from a hike from the Walled Village to the Great Wall and then up and over to the Little West Lake. Photos from an easy hike in the Huanghuacheng area that finished at the Little West Lake, a park area in Huairou. 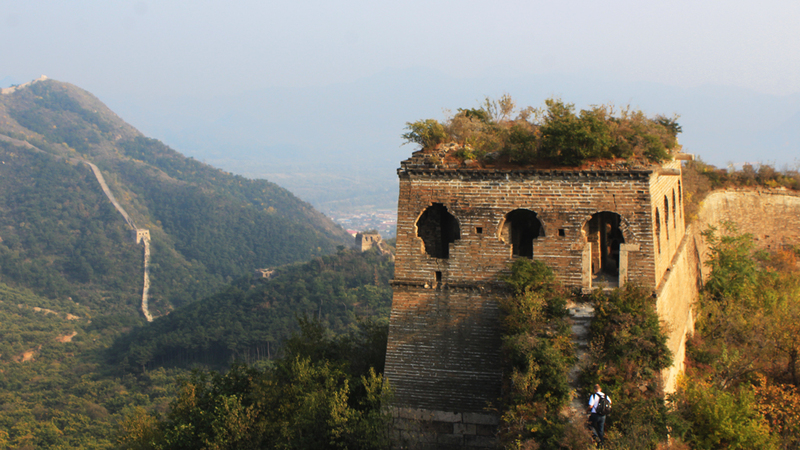 Photos of the Walled Village, the Huanghuacheng Great Wall, and the Little West Lake reservoir on a blue sky hike. This is a popular hike that visits the Great Wall in an area called Huanghuacheng, which means “Yellow Flower City”. It rises up quickly from a valley to provide hikers with great views of the hills nearby, which at this time of the year are covered with flowering fruit trees. Click through for photos and more!